Basic computations involved in making a choice. 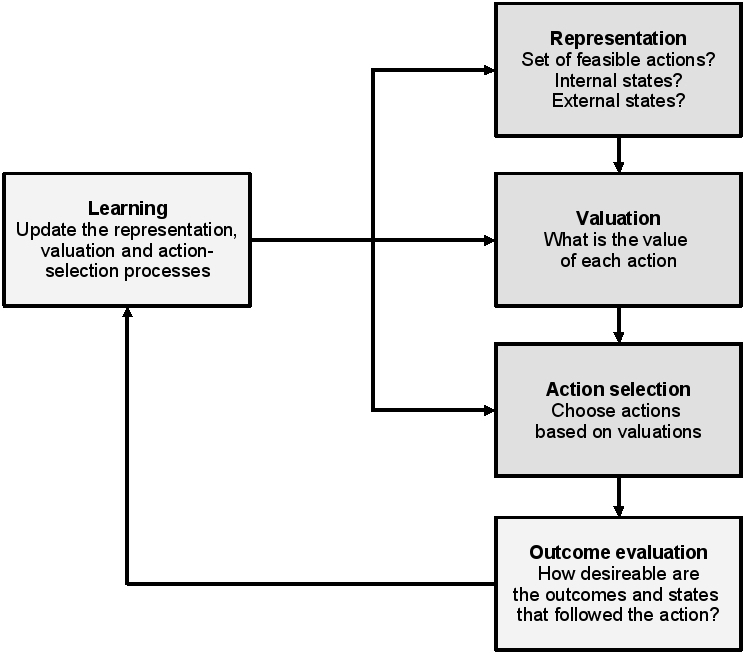 Value-based decision making can be broken down into five basic processes: first, the construction of a representation of the decision problem, which entails identifying internal and external states as well as potential courses of action; second, the valuation of the different actions under consideration; third, the selection of one of the actions on the basis of their valuations; fourth, after implementing the decision the brain needs to measure the desirability of the outcomes that follow; and finally, the outcome evaluation is used to update the other processes to improve the quality of future decisions. In my own emerging work on this arena, I am trying to combine this with recent advances cognitive neuroscience. 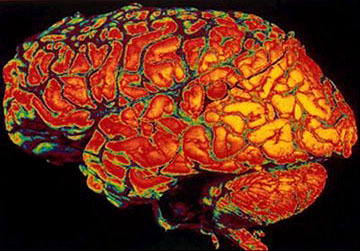 First, the advances in imaging genetics, i.e., the knowledge and study of how genetic variance leads to specific changes in neurotransmission, which in turn may affect cognition, emotion and behaviour. Second, the advances in the cognitive neuroscience of ageing, i.e, the relationship between age-related changes in brain structures and functions, and mental alterations. Briefly put, in a just submitted manuscript, I suggest that the Rangel-Camerer-Montague framework can serve as a model for looking at genotype and age effects. This leads us to three advances: first, it provides a better way to illustrate and understand the minute details of the preference and decision making systems. Second, it serves as a demonstration that individual (and intra-individual) differences must be taken into account. The “economic agent” is not a homogenous subject, but an agent that differs from person to person and with persons over time. 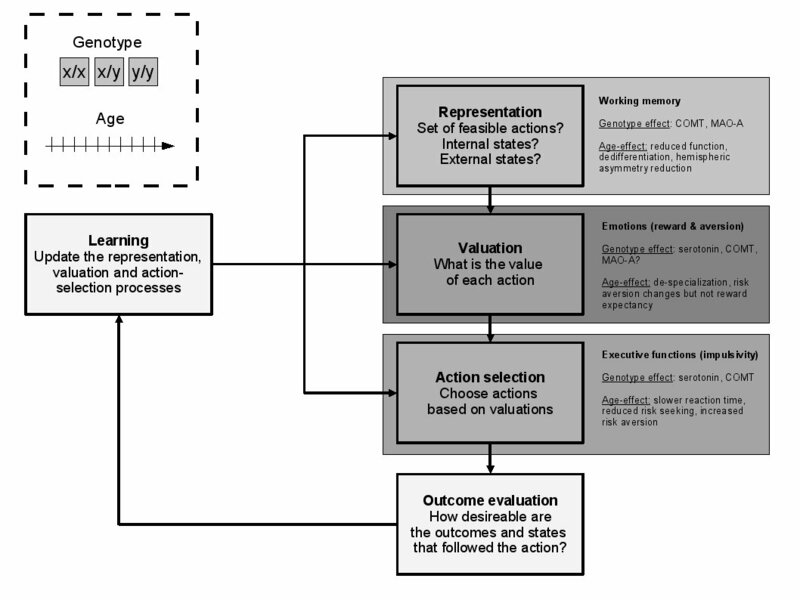 Finally, it may also serve as a framework for identifying potential ways to induce alterations in the systems, e.g., through medical intervention. More on this story later, given that the manuscript is accepted 😉 For now, here’s an illustration of how genotype (exemplified through COMT, MAO-A and 5-HT) and age effects may expand the model. Of course, this is only scratching the surface, but I hope you’ll see what I mean. This is an extended version of the Rangel-Camerer-Montague model. Within each processing node, two dimensions are added, here exemplified with the three primary nodes. The genotype dimension is a categorical variable that divides subjects into two or three classes, while the age dimension is continuous (inset, top left). Ever wondered about the neurobiology of memory — how the brain stores information? And, if you know slightly more, how information is stored beyond the hippocampus, or what happens to memory during recall? If you have anything to do with memory — even having a slight interest in the topic — the journal Neurobiology of Learning and Memory now hosts a special issue on the role of protein synthesis in memory. The issue is packed with updates on the findings and controversies on this topic, and it is certain to bring you to up to date on the neurobiology of memory. The goal of collecting these papers was not to find a single clear view, laying to rest one alternative view or another—a rather delusional goal at best. Instead, the attempt was to provide a venue through which different perspectives could appear together, with the understanding that all contributors are interested in a common purpose, to identify the ways in which brains make and hold new memories. Across these papers, there is agreement on the basic findings. All authors agree that proteins and protein synthesis are important to memory formation, but disagree on the question of whether new protein synthesis specifically triggered by an event is important for the formation of memory for that event. Some of the alternatives suggested include protein synthesis needed to maintain cell integrity, to replenish proteins ‘consumed’ by plasticity mechanisms, and to provide particular proteins that might be modified by experience, with long-lasting modification perhaps themselves representing cellular memory. The diversity of opinion collected in this special issue, and briefly summarized here, offers an opportunity for readers to examine how different researchers, each sharing a common goal of understanding how memories are made, can view the same data set and come away with disparate opinions. In this way, the readers may find this discourse useful in identifying the important questions, if not the answers, surrounding the roles of protein synthesis in memory. The race is on to pinpoint how the human genome has changed since the last common ancestor of chimps and hominids. With more and more genomes being sequenzed it has become possible to compare species and locate the regions where DNA has remained static over the last ~5 million years, and where it has evolved rapidly. An extremely exiting paper reporting such a genome-wide scan in a range of animals, including humans, has been put on-line today at the Nature website. The paper identifies 49 so-called Human Accelerated Regions (HAR) where sequences are evolutionary conserved among many mammals but has diverged rapidly in humans since the last chimp-human ancestor. The fastest among these, dubbed HAR1, has accrued 18 changes in this time. As it turns out, HAR1 is not a protein-coding sequence but belongs to a non-coding RNA sequence. This is rather interesting since geneticists (and evolutionary psychologists) generally assume that adaptations work on protein-coding genes. This new result may indicate that many of the adaptations setting the human genome apart from the chimp genome can have taken place outside of the genome’s protein-coding sequences. Now, if we could just manage to extract DNA samples from the various hominids fossils linked with major evolutionary changes (homo erectus and so on), we might some day end up with a clear picture of how the hominid brain has evolved. What an amazing triumph that would be! By the way, in last week’s Science Paul Mellars had a nice review showing how genetical analysis also illuminates our understanding of the dispersal of modern human populations out of Africa some 60,000 years ago. You might want to read that as well. Pollard, K. (2006): An RNA gene expressed during cortical development evolved rapidly in humans. Nature, in press. Mellars, P. (2006): Going east: New genetic and archaeological perspectives on the modern human colonization of Eurasia. Science 313: 796-800. UPDATE: You can find nice comments on this truly pathbreaking paper at Carl Zimmer’s, John Hawks’ and the Gene Expression weblogs. Our opinion outlined in this article is that the generalist genes hypothesis is correct and that genetic input into brain structure and function is general (distributed) not specific (modular). The key genetic concepts of pleiotropy and polygenicity increase the plausibility of this opinion. Generalist genes have far-reaching implications for cognitive neuroscience because their pleiotropic and polygenic effects perfuse the transcriptome, the proteome and the brain. This is more than a ‘life-is-complicated’ message. DNA and RNA microarrays provide powerful tools that will ultimately make it possible for cognitive neuroscience to incorporate the trait-specific genome and transcriptome even if hundreds of genes affect individual differences in a particular brain or cognitive trait. The more immediate impact of generalist genes will be to change the way in which we think about the relationship among the genome, the transcriptome and the ‘phenome’ of the brain and cognition. Genes are in essence instructions for fabricating biological structure. In the construction of a house, one finds both some repeated motifs and some specializations for particular rooms. Every room has doors, electrical wiring, insulation and walls built upon a frame of wooden studs. However, the washroom and kitchen vary in the particulars of how they use plumbing array fixtures, and only a garage is likely to be equipped with electric doors (using a novel combination of electrical wiring and ‘doorness’). Constructing a home requires both domain-general and domain-specific techniques. The specialization of a given room principally derives from the ways in which high-level directives guide the precise implementation of low-level domain-general techniques. When it comes to neural function, the real question is how ‘generalist genes’ fit into the larger picture. Continuing the analogy, one might ask whether different ‘rooms’ of the brain are all built according to exactly the same plan, or whether they differ in important ways, while depending on common infrastructure. Kovas and Plomin presume that the sheer preponderance of domain-general genes implies a single common blueprint for the mind, but it is possible that the generalist genes are responsible only for infrastructure (e.g. the construction of receptors, neurotransmitters, dendritic spines, synaptic vesicles and axonal filaments), with a smaller number of specialist genes supervising in a way that still yields a substantial amount of modular structure. these traits have been assessed. Therefore, a genetic polymorphism that is associated with individual differences in a particular cognitive ability will also be associated with other abilities. The question is how these generalist genes work in the brain. Does a genetic polymorphism affect just one brain structure or function, which then affects many cognitive processes, as suggested by a modular view of brain structure and function (mechanism 1 in [Kovas and Plomin’s original article])? This model assumes that brain structures and functions are not genetically correlated – genetic correlations arise only at the level of cognition. Another possibility, which we think is more probable, is that the origin of the general effect of a genetic polymorphism is in the brain because the polymorphism affects many brain structures and functions (mechanisms 2 and 3 in [Kovas and Plomin’s original article]). Of course, some polymorphisms might have general effects via mechanism 1 and other polymorphisms might have general effects via mechanisms 2 and 3, as Marcus and Rabagliati suggest. Fortunately, this is an empirical issue about DNA polymorphisms that does not require resorting to metaphors such as house-building. We did not say that the case for mechanism 3 was proven, which is what Marcus and Rabagliati imply with their partial quote. The full quote from our article is: ‘In our opinion, these two key genetic concepts of pleiotropy and polygenicity suggest that the genetic input into brain structure and function is general not modular’. Pleiotropy (in which a gene affects many traits) is a general rule of genetics. Polygenicity (in which many genes affect a trait) is becoming another rule of genetics for complex traits and common disorders. As we point out, polygenicity greatly multiplies and magnifies the pleiotropic effects of generalist genes. A more empirical reason for suggesting that the origin of generalist genes is in the brain is that gene-expression maps of the brain generally indicate widespread expression of cognition related genes throughout the brain. I second that sentiment. It would be a big step forward if the massively modularity discussion would move beyond mere speculation and become grounded in empirical data. Kovas, Y. & Plomin, R. (2006): Generalist genes: implications for the cognitive sciences. Trends in Cognitive Science 10: 198-203. Marcus, G. & Rabagliata, H (2006): Genes and domain specificity. Trends in Cognitive Science, in press. Kovas, Y. & Plomin, R. (2006): Response to Marcus and Rabagliata. Trends in Cognitive Science, in press.